I was attracted to this recipe because I find that many 'savory' recipes involving pumpkin are way too sweet for me - I don't want my ravioli or lasagna to be sprinkled with amaretti cookies, for example! These pumpkin wontons go in a different flavor direction with creamy cheese, tarragon, and spicy red pepper flakes. The end result is just slightly sweet from the pumpkin. The original recipe calls these ravioli, but I wouldn't really top these with tomato sauce like I would most ravioli. 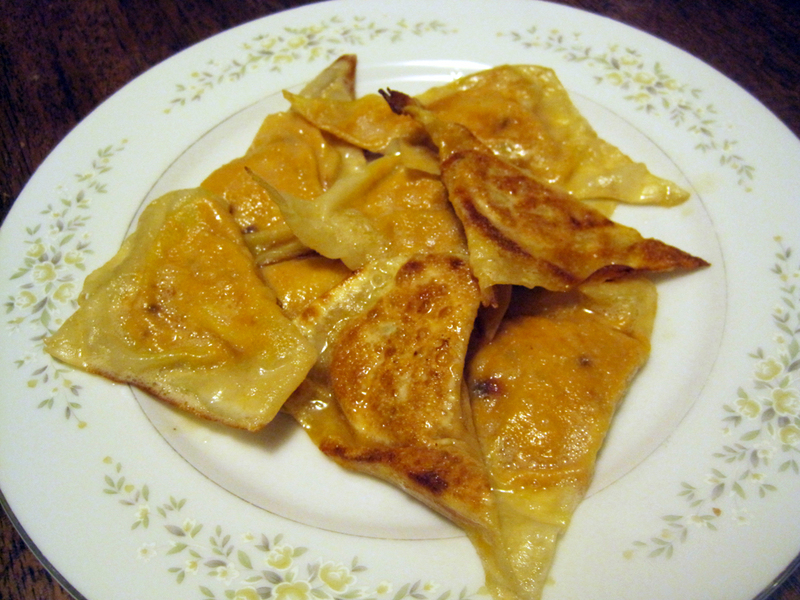 Something about using the wonton skins just doesn't feel like ravioli to me - but, these are still a really delicious lunch or dinner! The wontons are boiled and then fried up in a little butter until crispy, which makes for great textural contrast between the creamy filling and crispy exterior. I ate the wontons with just the butter for sauce and a salad on the side, but you could also add some sauteed veggies in the sauce - leeks or fennel would be delicious. One word of warning - don't try to freeze these as the wonton skins are too thin - they simply fell apart when I tried to boil a few that I'd frozen and I lost about half the wontons. 1. Whisk together the filling ingredients and chill for at least 15 minutes. 2. Lay out wonton wrappers and place a small amount of filling in each (the amount will depend on the size of your wrappers - I used about 1-1/2 tsp per wonton). Brush the edges with water and fold over into a triangle. Try to seal the edges as tightly as possible and to squeeze out as much air as possible. Lay out finished wontons in a single layers. At this point you can freeze some of the wontons if you like. 3. Boil a pot of water and salt it. Boil the wontons in batches, about 2 minutes per batch, being careful not to, overcrowd your pot. Once the wontons are boiled, lay them out in a single layer, being careful not to overlap them. 4. Melt the butter in a nonstick skillet until bubbling. Arrange the wontons in a single layer (working in batches), browning until the wontons are as crispy as you like. What fun and tasty looking wontons! This is exactly how I like to eat my ravioli! A light butter sauce or just a little oil. I love the use of the wontons and frying them for a touch of crispy. Great idea and great recipe!